Hitachi introduced two new interactive project models at InfoComm 2014 last week, the Hitachi CP-TW3003 and CP-TW2503. 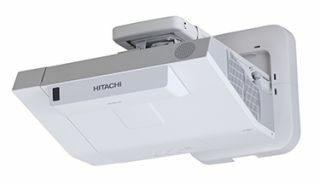 The new models feature an ultra-short throw design and they integrate Hitachi’s powerful software to deliver a complete interactive experience on any flat surface. With a rich feature set that meets the specific interactive needs of K-12, higher education, and corporate users, the CP-TW3003 and CP-TW2503 are both easy to install and easy to calibrate. They provide vibrant image quality with cost-effective operation and produce large images in small spaces. New generation interactive features include multiple pen capability, auto-calibration, PC-less drawing, and multi-display interactive use. Additionally, a suite of advanced features normally found only on the higher end models includes High Dynamic Contrast Range (HDCR), 2 HDMI ports, and Hitachi’s original technology Accentualizer that allows the projected image to appear more real by enhancing sharpness, gloss and shade. Plus, Hitachi’s Intelligent Eco and Saver Modes with ImageCare combines optimal picture performance with energy-savings for a lower total cost of ownership. The CP-TW3003 features 3,300 lumens of brightness, while the CP-TW2503 offers 2,700 lumens, both models offer three USB inputs for use with a USB memory stick, wireless adapter or mouse plus component, composite video, audio and mic AV jacks. Both projectors have computer monitor and audio outputs. In addition, they have RS-232C and RJ-45 Ethernet ports. An optional wireless adapter lets users connect their computer to the projectors via a wireless network. The projectors’ PC-less presentation feature enables users to project images directly from a USB thumb drive, eliminating the need to connect a computer.